Big Sky Basketball: How Good With Michael Harthun Be? 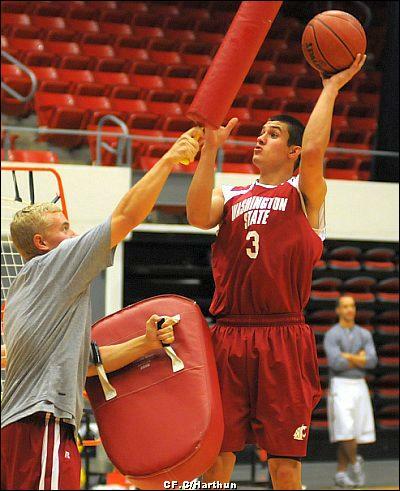 You might not know him really well yet, but I am guessing Michael Harthun will be a key factor in whether Portland St. will get back into the top 3 of the Big Sky, or if they will continue to flounder in the middle of the conference. In case you don't know, Harthun spent two seasons at Washington St before transferring to Portland State after his sophomore season. He sat out last season, and will be eligible to play (and figures to be a key contributor) for the Vikings this season. Harthun was a prep star in the state of Oregon at South Medford High School, where his team played for two state titles, winning one his junior season. The 6-3 guard scored 1,949 points as a four-year starter, second only to Duke forward -- and former teammate -- Kyle Singler. Harthun won a myriad of honors at South Medford and was a three-time All-State selection. Excellent guard prospect. Confident shooter from the perimeter, especially deep. Can shoot it from different spots on the court. Could wind up being a point or combo guard. Safe to say that not a lot of players with his high school credentials wind up in the Big Sky Conference, which is why Vikings fans should be excited about him. (Sidenote... this blog posting from 4 years ago seems to think rather highly of him)! However, from his two years in Pullman, it is clear that while he is an important piece of the puzzle, it doesn't look like he is a program saver. For his career (in limited sample size), he shot about 30%, and his efficiency numbers last year were pretty bad. Despite being the best player in WSU's 2008 recruiting class, he couldn't find consistent minutes or earn a spot at the high conference level. But things should be different at Portland St. With Charles Odum and Chehales Tapscott entering their senior years, Harthun just needs to be a good role player, and he should have the talent to be that. They will look to him to provide outside shooting and scoring punch, and if he can fill that role, the Vikings will have a great chance to sneak into the top 3 in the Big Sky. What do you think are reasonable expectations for Harthun? Can he show the talent that made him a 3-4 star recruit? This blog will be watching closely. In our first exhibition game Harthun hit 21 points, half of them 3s, and pulled down 6 rebounds. Looks good at this point.